The Helper is the story of John Sloan, a Marine Corps veteran with a life-long secret that is haunting him. He is a conduit to a healing light that draws him to people on the brink of emotional disintegration, people who are then healed and Helped by this light. His blue-collar world is shattered when he finds that his connection to this anonymous portal has vanished. 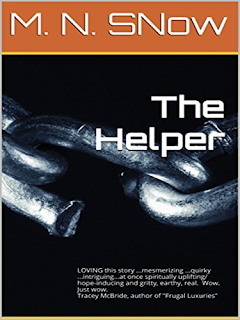 He is alone, seemingly beyond aid, and in desperate need of a Helping himself. The book tracks the intersecting lives of John and two other Helpers. His lifelong friend Dusty Hakalla is a mixed-blood Ojibwe, with a secret of his own. His power to help is remarkable, but was once destructively misused. A career Marine, his scarred childhood and momentary abuse of power have left him jaded and bereft. Deena Morrison, also a Helper, is John’s girlfriend. Adopted as an infant, she flees John to find her birth-mother, while carrying within herself her own secret. Another character shadows their lives as narrator, Nan’b’oozoo, the trickster god of Ojibwe legend—at times sarcastic and petulant, at others insightful and humorous. The author’s bio includes years as a public radio host and anchor, primarily in the south Florida market, but also for Wisconsin Public Radio. M. N. has had various short stories published, and is also a published cartoonist, a former contributing writer for Reader Weekly (Duluth, MN), and a former Marine Corps NCO. After spending some years at home, in the Twin Ports of Duluth, MN/Superior, WI, writing the book, the author is currently back living in Key West, FL.